This shepherd’s pie fuses both fall and winter flavours. November and December in Canada may mean saying au revoir to fall’s colour, but that doesn’t have to translate into good-bye to fall’s earthy cooking smells too. This month’s recipe fuses both fall and winter. The sweetness and orange colour of the sweet potato blend perfectly with the heartiness of the lamb and rosemary, with a little hint of fall popping through in the grilled corn and green peas. From my family’s table to yours! Peel and cube the potatoes as you normally would for mashed potatoes. Place them in a pot and cover with salted cold water, and bring to a boil. Cook until fork tender. Strain and mash the potatoes, folding in the butter as seasoning to taste; cover to keep warm until needed. Place ground lamb on a plate and season well with salt and pepper. In a medium frying pan on medium-high heat, cook lamb until well browned. Strain off the lamb and place it in a bowl off to the side for now. Using a Tbsp or two of the lamb fat, cook shallots and garlic on medium-low heat until translucent. Place the browned lamb back into the pan. Turn the heat up to medium and deglaze with the red wine, simmer for 1 minute. Add a tbsp of flour and the rosemary; stir until distributed. Add beef stock, simmer for 5 minutes. 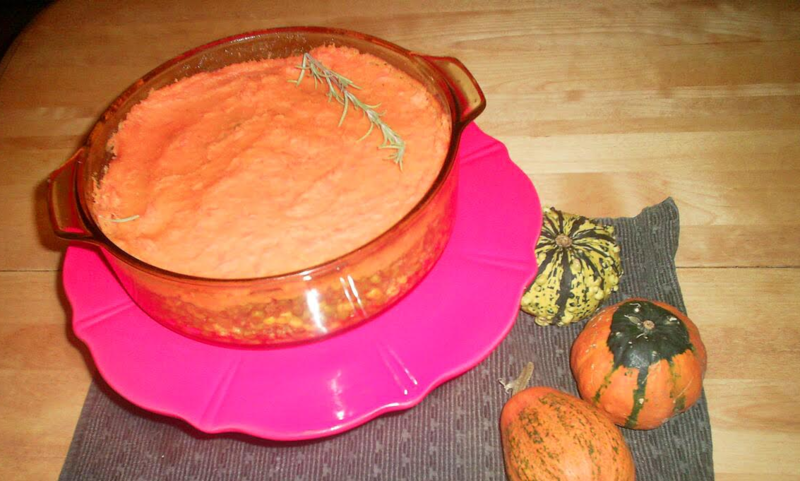 Pack this mixture into a casserole dish or a bread mold and cover the top with a thick layer of sweet potato mash. Using a fork, score the top of the potato for decoration. Place in preheated oven for 20 to 30 minutes or until potatoes get some colour. Serve with a glass of cabernet sauvignon or pinot noir to keep warm on a cold November evening.